In February 2008 England played their first match under Fabio Capello. In the build up to the game there had been much talk of a renewed discipline about the squad: players were to wear lounge suits for meals, nicknames were to be banished. It was all part of a plan to put the pride back into wearing the England shirt. Behind the scenes at the head office of Umbro, a similarly ingenious plan was being discussed to achieve the same goals through innovations in sportswear. Without prior knowledge of Capello’s vision, the company had started an internal debate that would trigger a radical rethink of the way they approached the design of the England kit, one that they hoped would not only revolutionize the future of the football strip, but would reinvigorate the company. The end result of that process was unveiled on the pitch of Wembley Stadium on March 28 in the game against Slovakia, revealed not on the catwalk in a puff of smoke, but thrown into action in the suitably high performance environment of an international football match. Its all-white style is a first for England’s official home strip and its sleek ultra-modern design allows players far more freedom of movement. Stylishly tapping into a tradition of tailored English sportswear, it is the perfect antidote to decades of polyester replica football shirts, while through its lovingly re-crafted three lions badge it emotionally reconnects with England’s past. But how did the design team arrive at this innovative new strip? For a vision of the future, Umbro went back to its past. A company with a rich football heritage, it had been founded in 1924 and in the days before mass produced sports apparel, football kits were tailored, a skill that Umbro prided itself in and even boasted about on the labels of its garments: ‘Tailored By Umbro In England’. With all the talk of the England team needing to rebuild its fragile confidence and adapt a winning mentality, the shirt now needed to play its part. Traditionally Umbro had always attempted to improve the team’s performance through fabric innovation, now the challenge was to see if it could find a way to help improve the team’s confidence too. For inspiration, the designers went back to an iconic image of Bobby Moore from 1966. Not the one in red, with Moore clutching the Jules Rimet trophy, but another eye-catching picture of the England captain, immaculately dressed from head to toe in dazzling white as he leads his team onto the Wembley pitch for the World Cup quarter-final clash with Argentina. If drawing on images of the past was proving an inspiration, so was Capello’s vision for a smarter, more disciplined England team. His belief in formality, attention to detail, and team unity over personal flair seemed to chime with the values that Umbro were trying to build into the kit, and both Capello and his General Manager Franco Baldini were given the opportunity to give their feedback throughout the process. Having arrived at a groundbreaking concept, Umbro knew where to look for the kind of inventive thinker that this project required. Inspirational young designer Aitor Throup had first come to the company’s attention when winning an award annually sponsored by Umbro at the Royal College of Art. Very early on it was apparent Throup was the person they needed to work with David Blanch. The initial concept team was completed by Devon Burt, a Design Director at Umbro’s parent company Nike and the man who had restyled Andre Agassi’s Wimbledon outfit to such global impact in 1991. He came to the project as an outside pair of eyes and a valuable sounding board. The first incarnation was a crude patchwork focusing on just the moving joints and how the shirt could be designed to aid performance. The designers began with a base layer, the undergarment worn by many footballers, designing it to work in tandem with the shirt. In an attempt to replicate the movement of the skin on a joint, they used ‘rib’, the most basic of stretchable fabrics. The end product was a two-layered prototype – undergarment and shirt – that actually moved with the body, one that could give the players the feeling of more control over their motion. In keeping with the ‘Football Tailored’ idea, Umbro invited Savile Row tailor Charlie Allen to bring a traditional English tailoring perspective to the project. One of his first suggestions was a more formal collar, when the designers had been toying with a crew neck. He also brought a craftsman’s eye to the seaming of the shirt, helping to streamline the garment. After spending so long developing an impressive new kit, the last thing wanted was for the England team to turn up on matchday and be offered either a small, medium or large. This England kit would be bespoke, and the players would be measured for it as if for a finely crafted, made-to-measure suit. “We did fitting sessions with the players very much as you would in Savile Row,” says Blanch. 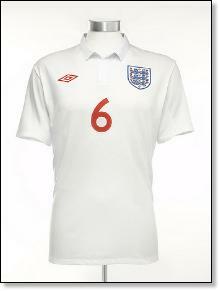 In keeping with the image of Bobby Moore that had proved so inspirational, it was decided the kit should be all white. Aside from the badge and an unassuming Umbro diamond, there is no other colour, leaving it a pure statement of confidence. With just a white crest on the white shorts, and nothing on the socks, the overall effect of this striking image is to drive all focus towards the FA’s new three lions crest. With the concept of ‘Football Tailored’, Umbro has acknowledged its long tradition of sports tailoring whilst utilising all the benefits that modern technology can offer. For the England players this means a bespoke service that will see them take to the field in their own made-to-measure strip; while for the fan this means a tailored shirt, sold by chest size for the first time to give everyone the chance to look their very best.